The theory presented by Johnson goes something like this: good ideas don’t appear above your head in the form of a lightbulb. Innovation isn’t a “eureka!” moment. Great ideas and innovation come from walking through doors … well … not literally walking through doors, but rather opening a network of knowledge. Think about it this way, a commercial airplane flying from New York to London in under an hour sounds like a great idea, but we need to open more doors to get there. Planes can fly past the speed of sound, but commercially there are too many unanswered questions. Too many steps between now and then. Those unanswered questions are the rooms in the house we still need to walk through before the one hour flight becomes a reality. To illustrate the path of innovation and good ideas, we’ll use the university marketing office. To start making online design and content decisions based on website conversions (prospective student inquiries, applications, campus visit sign-ups), the team first needs to understand how to find and how to interpret their current website metrics. If we have 1,000 website visitors to our page, is a 2% conversion rate for the campus visit sign up good? What percentage of visitors to our admission’s homepage should we expect to complete an inquiry form? Thirty percent? Three percent? Three-tenths of a percent? By the time marketers reach the point of personalization, it’s often because they’ve opened the first three doors. Note: you can’t get to doors two through four without opening door one. Door One: The marketing team or “the person who does the email” sets up an account. It might be through your higher education CRM or through an email marketing client like MailChimp or Constant Contact. Door Three: The questions answered through door two lead the team to start reaching for the stars: higher open rates and click through rates. “What if we segmented emails based on graduation year, major, location? !” Now the content of the emails are different for each segment. Application information isn’t relevant to sophomores in high school, but visit days are. Local college fairs certainly are. What happens when email is segmented? Click through rates increase. Though GeoFli focuses specifically on geotargeting and website personalization, we’ve been known to let curiosity get the best of us in the form of assisting GeoFli customers create and measure online marketing initiatives. In a recent segmented email campaign, we took the subscriber list, cut it in half, and sent one generic email to the first half. Those metrics are on the bottom in the simple table below. 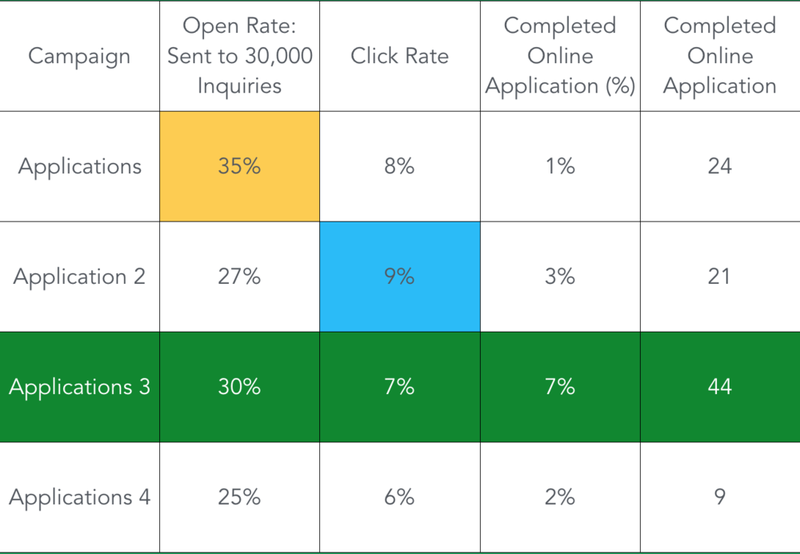 You’ll notice when we took the second half of the list and used a personalized title combined with personalized content, both the open rate and the click rate were significantly higher. Door Four: What happens after the user moves from email to website? Now we’re measuring on-page conversions, time-on-site and bounce rate. In the example below, this email targets all of the email subscribers from your list within a 50 mile radius of Denver using IP address and geolocation. Next, the email sends if and only if that user has also opened a campaign in the past and visited the application page on the website BarnabyUniversity.org/apply. 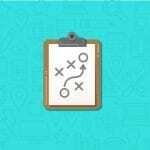 Which email performs best? If you’re only looking at open rate, campaign one (yellow). If you’re looking at click rate, the answer is blue. And finally if you’re measuring toward website actions and goals, the third campaign in green is your champion variant. Door One: Set up email marketing campaign. Door Four (Green): Everything you’ve worked for has led to this moment in time (too dramatic? ); your goal is online applications and you’ve created an automated email workflow, started to sample different subject lines, measured the click-through rate and now you’re ready for real website personalization. Notice if we based our decision on which email is the most effective, the answer changes as we progress through the doors. The campaign “Applications 3” outperforms the other campaigns by a landslide.